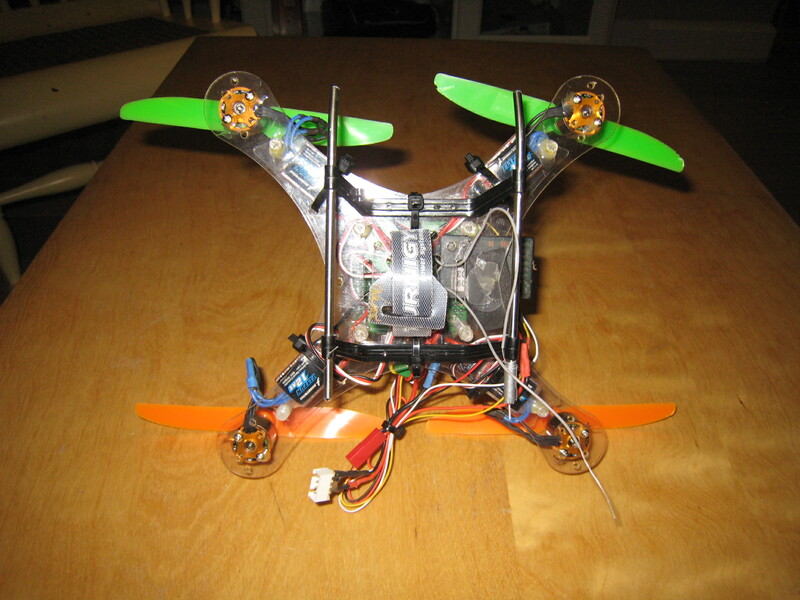 I wanted to do a mini FPV Quad and did not find a detailed setup of what could be done, so here is mine which works pretty good. Motors: A1510 2200kv get them here for 10.78$ (incl. sh.) each (if you order 4). ESC: Any 10-12A Esc should fit, the best would be to order some that can be flashed like the Blueseries but as they were not in stock I bought the Pentium 12A from Giantshark and they are ok 57.31$ for 4 (expensive but they deliver quickly unlike all the chinese stores). Props: 2 bladed Gemfan 5x3, get them here 7.11$ inc. sh. the pack of 4 or if you find cheaper elsewhere please share. Those are really tough and stock balanced. Stay away from the 5x3 from hobbyking they are crap. The Gemfan 5x3 3 bladed do not serve any purpose, the test was made on the bambucopter topic and they are not better then the 2 bladed ones. Lipo: 1300mah 3S nanotech. 8.87$ I use a tight velcro strap to slide the lipo. Camera: I chose this one from ebay 36.19$ incl sh. 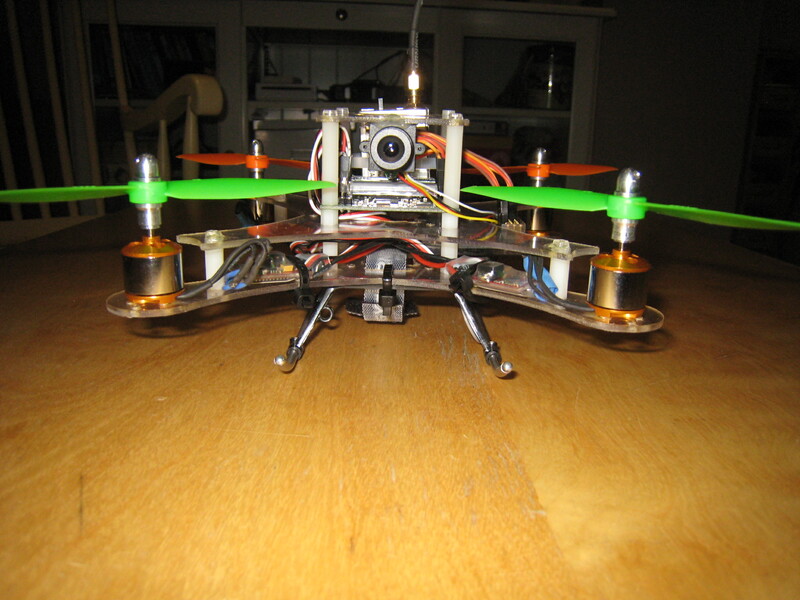 It's ok and has a regulator which is handy because you can power it directly from the 3S lipo, it has internal Mic also. Tx: I wanted something light and took this one from ebay 27.39$ and even got a partial refund after a complaint because on the product 200mw is stated and not 300mw (it doesn t have 1280Mhz either). After some tests it works but even with a LC filter I could not get rid of the ESC interferences so I installed a good old Fox-800 which is only 6g heavier and the picture is nice. So go for the fox-800 or as usual some quality/expensive stuff from readymaderc 43$. Also 1.2 GHz and 2.4 GHz dont work that well together, some people can solve this problem by using filters but some cant. 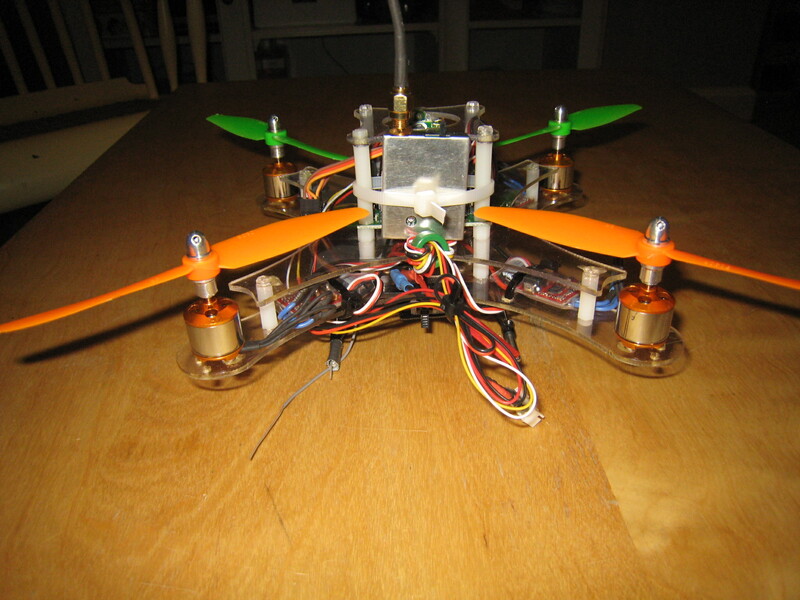 If you really want to fly with 1.2 GHz fpv just buy an 35/75MHz radio or a much more expensive UHF system. Problem with UHF is that the receivers are expensive (I already have 3 Dragonlink) and heavy! I am at my weight limit here. But I'll test a 5.8Ghz kit in the next weeks we'll see how it goes.